Ok before the breaking news, a reminder about the online benefit auction for our organization, the Be a #BellaOriginal Foundation Inc. The auction ends tomorrow night (9/28 at 8 pm central time). There are so many great items to bid on from jewelry to a guitar lesson! All proceeds go to help us with our anti-bullying programs. Just head to our Facebook page and the auction album is pinned to the top! Now for the "breaking news"! - Coming October 1 is our newly designed web site and we'll be offering Layaway through the holidays. 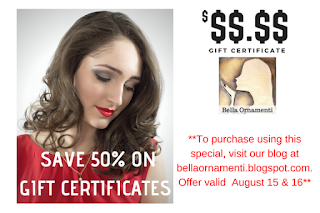 Be sure to check www.bellaornamenti.com on the 1st! So let me know how awful (or not so much) you think it is!